Rebuilding an old Jato. What to do? Thread: Rebuilding an old Jato. What to do? 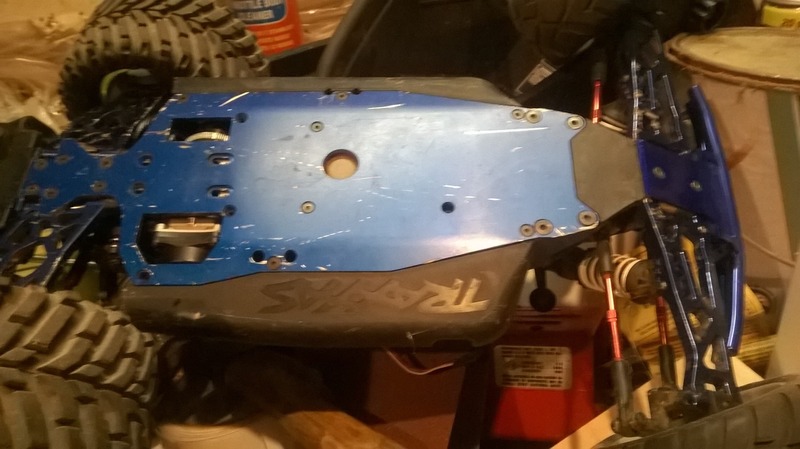 I found an old Jato in my basement and want to rebuild it. It needs a new motor without a doubt.. But what other major parts should be replaced? Or just replace what's broken? I can get better pics this weekend. What tires are those on the rear? Seem massive! I still have a jato. I converted it to electric. Kind of rejuvenated my interest in it. Now I run it pretty frequently. Might be worth replacing the fuel tank. If it's been stored that long, and if it had any fuel in it, it's going to be pretty gunked up. Less headache to just replace it instead of fighting with it. That chassis looks pristine! Mines due for a replacement... the rear is ground down pretty thin. No idea on the tires, but I do agree. Definitely not stock! Haha. I found a couple fuel tanks for around $7-10 new on eBay so replacing that without a doubt. Has some upgrades, that's for sure. A lot of aluminum. The front end is quite loose feeling though, it's all wobbly just pushing it around. Disassembling it now and will see if anything obvious plus give it a good cleaning. Yep, could use a bath, that's for sure. I run RPM arms on mine. I broke a few things on there repeatedly. The rear tower was one of them. Even had it break the trans case once instead of the tower, so not sure I'd run alloy for that. Then again... I jumped mine like a MT. 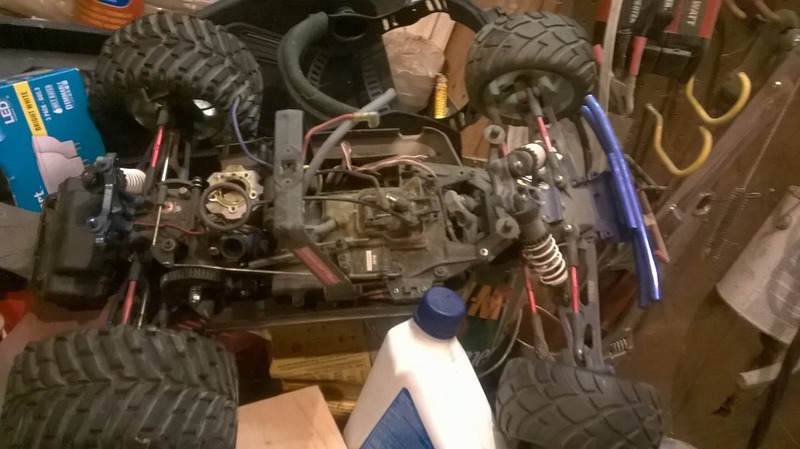 Mine was/is hideous to look at, but I made a steel brace for the rear tower that connected to the roll bar on both sides, then I rarely broke the rear tower. I also made a very crude plate for both the front and rear inside turn buckle ends to tie the left to the right as they tend to rip out of the bulkheads. I should redo the rear one... I was very hasty with it. One other thing I kept breaking was the crank case. Pretty sure it was because I'd really air it out. When it would slap the ground, the crank case would crack right under the ears of the mounting tabs. After the 2nd TRX2.5R crank case and the first OS18TM crank case... I had to do something! At first, I thought it was the engine contacting the ground on roof landings, so I cut the cooling 1/3 of the head off. The 2.5R ran cool in that truck, so a bit smaller head didn't bother me much. Then I cracked another one! Was then I realized it had to be the chassis slap doing it. 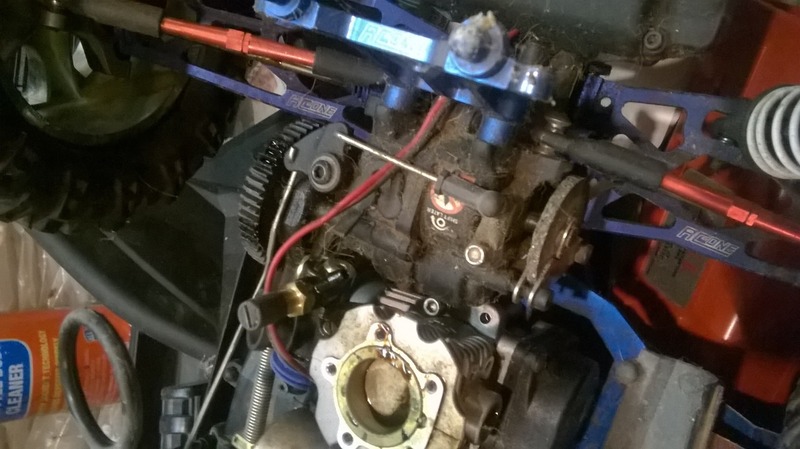 I took the engine out, cleaned the engine mount/engine bay, then built a little dam with masking tape inside the mount. Then I coated the chassis with a bit of oil and the bottom of the crank case, then put a puddle of jb weld in there and mounted the engine. Once it cured, I had a form fit cradle that supported the entire bottom of the engine. The oil on the chassis/crank case allowed it to be cracked loose so it could slide to adjust mesh or to remove the engine. Never broke a crank case after that. Now that it's electric, I don't have that issue, but the rear tower was still an issue, and with the electric conversion, I didn't have the roll bar anymore, so I had to fiddle with that to sort something out that wasn't in the way, but still supported the tower. I had to run CVD's on the rear too as electric torque shredded the plastic ones on my first test run. I recently added some hub extenders on the rear. Not sure if I had the wrong wheels or what, but the rear was always about an inch narrower overall than the front. Now it's almost the same width. Good luck with your rebuild. Always was a fun truck in any form. Thanks for the very long and detailed response!! Love all the custom work you did on yours! Mine will be a basher/beater/etc for sure. Not doing any extreme jumps but I want something fun that I don't have to worry much about. If all goes well, I won't have much $$$ into it besides the new engine. I was looking at getting an HPI(Can I say that here? lol) Savage X 4.6 but I'd rather get a taste of nitro without spending half a grand first. My plan right now is to put a Novarossi 2.5 in it. Cheap and reliable from what I can tell. I will get some better pictures of the whole thing this weekend I hope. I believe my father started to take it apart so I will see. Will like to see some footage of that once you get it running. I have a savage x as well as a couple nitro revo's. I have mostly electric now, but I still have 3 nitro's to scratch that itch when necessary. I just ran out of places where I can run them. Electric is so quiet that people don't call the cops on the 40yo dude playing with "toys" at the park. But I still enjoy my nitro's. For sure I'll post some videos once I get it up and running! Yeah, it's hard to justify Nitro on anything but the fun factor. But that's a big point! We have a huge backyard with no neighbors close so I still have a place, haha.